Haasil is the story of two friends who have contrasting personalities and family backgrounds. 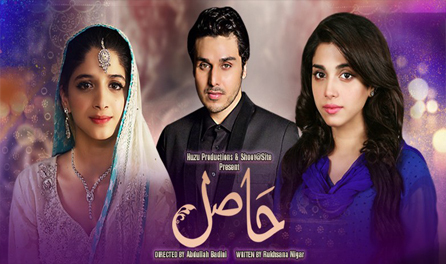 Hareem (Mawra Hocane) is wealthy and carries religious personality while Rimsha (Sonya Hussain) is underprivileged and living as an orphan with her sister. Rimsha’s parents had a dark past which is constantly reminded to her by close ones. This translates into her carefree attitude towards life and relationships. Due to her circumstances, she becomes very different person as compared to Hareem. One day, Hareem and Rimsha starts arguing on their lifestyles where Hareem questioned Rimsha’s character and dub her wrongdoer. This devastated statement aggravates Rimsha and she vows to take revenge. As now they turn into rivals, so what happens next? Will they be able to resolve their differences? Will their relationship mend?